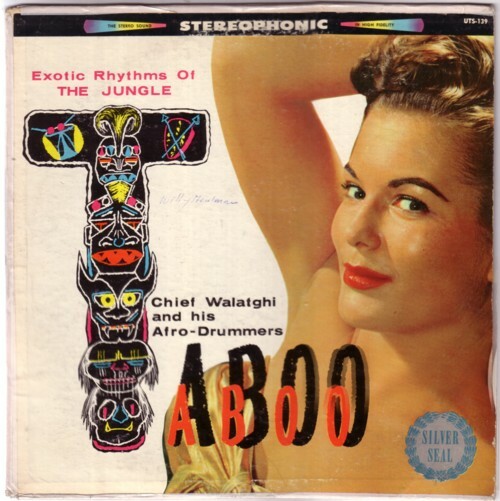 There is no information at all on Chief Walatghi & his Afro-Drummers on the LP. And both the cover (some very white Hollywood model) and the label ( Silver Seal ) promised little to nothing for the music. Silver Seal is famous for LP’s like Italy in song and Barons of Dixieland , so i expected this Taboo-Lp to be in the same category. To my surprise the ten songs on this LP are among the best I know in the ritual percussion genre. I have serious doubts about the authenticity of these recordings (although Silver Seal doesn’t make any claim that the recordings are authentic), but it does sound very jungle-like! Great percussion, nice screaming and not much other instruments. All that lacks on this LP is a fake story on the back cover, of how a recording engineer got lost in Dark Africa and returned with tapes of the ritual, that was organised for his sacrifice to the Jaguar-god of the tribe, but which he miraculously escaped at the very last moment. I would not be surprised if these same recordings were released by other labels on other records with different titles, but so far I have not found any. Here is Chief Walatghi & his Afro-Drummers with Facii .